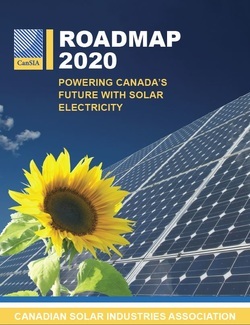 The Canadian Solar Industries Association (CanSIA) is excited to share its vision of Canada's solar electricity industry in "Roadmap 2020: Powering Canada's Future with Solar Electricity." Roadmap 2020 lays out a confident plan that will achieve two primary objectives. It will solidify solar electricity as a mainstream energy source, and an integral part of Canada's diversified electricity mix. It will also ensure the solar electricity industry will be sustainable, with no direct subsidies, and operating in a supportive and stable policy and regulatory environment.